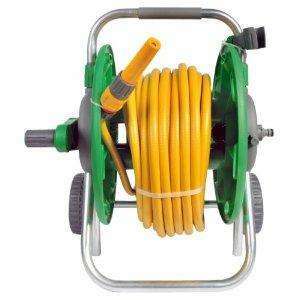 This reel holds up to 60m of 12.5 mm hose. Soft-touch telescopic 750 mm towing handle (90 mm increase). Supplied with 50m of yellow multi-purpose hose. spend more for anti kink hose,they last much,much longer! Yes, I just noticed this as well - checking to see if Grennfingers 'Gardening Deal of the Day‏' was indeed the best on the internet - same as at Amazon! It might make a good father's Day present. I've got that one, paid about £25 for it, very neat and tidy if you only need 25m. Usually dispatched within 3 - 5 weeks. Not good for father's day. Am I missing something? When I clicked on the link it's appearing at £50.36. Am I missing something? When I clicked on the link it's appearing at … Am I missing something? When I clicked on the link it's appearing at £50.36. Use this link and select Amazon.co.uk as a seller, although as previously said delivery time 3 to 5 weeks. Thanks, phoned my dad and he's just after purchasing this. 85p compared to hozelocks £ 3.50..............at the end of the day, a hose pipe, is a hose pipe ! It has extendable handles too so it can be pulled along! Why would you need 50 metres of hose?? oO That is unless you live in a mansion and if anyone did, they wouldnt really be on HUKD. I live in the sticks - NOT in a mansion - and need a 50m hose for the garden. Also, it's great for re-filling sheep's buckets in the lambing shed! Whoops that should be sheeps' (and not sheep's)! This was already covered in post #8 and 9. 3-5 weeks!!! May just about be In time for the lifting of the hosepipe ban!!! !